Pojo's Yu Yu Hakusho news, tips, strategies and more! Monday, 08.28.05 Quint Carr sent us a new summary for the Episode Guide. Thanks Quint! Friday, 02.18.05 Today's Card of the Day is Pinkie string of love from Alliance. Tron and titan matrix both have reviews. Thursday, 02.17.05 Today's Card of the Day is Breaking Point from Exile. Tron and titan matrix both have reviews. Tuesday, 02.15.05 Funimation has released another UnCut DVD. Ghost Files - Bandits and Kings has 3 episodes: Reunion of the Bandits; Torn Between Identities; and Inheritance. Amazon.com has this puppy for a penny shy of $15. Oops, forgot to post yesterday's card. So, today's Card of the Day is Banished. titan matrix, Crimson Eyes and TCGkid64 have a review. Friday, 02.11.05 Today's Card of the Day is The End from Exhile. Crimson Eyes and titan matrix have reviews. Wednesday, 02.09.05 Today's Card of the Day is Renounce from Exhile. Crimson Eyes and titan matrix have reviews. Tuesday, 02.08.05 No, you're not hallucinating! 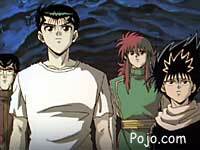 Well... you might be, who knows, but Pojo's Yu Yu Hakusho website is being transformed into the new and improved Pojo.com format. Enjoy! Today's Card of the Day is Yomi, Sightless God from Betrayal. titan matrix has a review. Monday, 02.07.05 We messed up a bit on the postings last week, so, this week you get an extra card review. 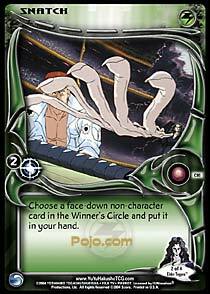 Today's Card of the Day is Forlorn Hope from Dark Tournament. titan matrix, Crimson Eyes and Stryyder have reviews. Friday, 02.04.05 Today's Card of the Day is Burst of Power from Yu Yu Hakusho. titan matrix, Crimson Eyes and Stryyder have reviews. Thursday, 02.03.05 Funimation is giving away a Yu Yu Hakusho autographed script. Details right here. We're re-kick starting our Yu Yu Card of the Day reviews after a brief departure. Today's Card of the Day is I'm Calling You Out! 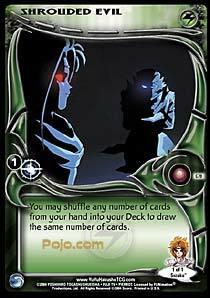 from Expansion: Dark Tournament. Titan matrix, Crimson Eyes and Stryyder have reviews. Drop us an email and to join in the reviewing process if you think you have what it takes. Friday, 01.31.05 Today's Card of the Day is Halt! from Expansion: Dark Tournament. titan matrix, Crimson Eyes and Stryyder have reviews. Wednesday, 01.26.05 How about 2 more exclusive previews cards from the upcoming Alliance Expansion set! Thanks again to the cool folks at Score! I should have a few more for you tomorrow thanks to Score! Enter the Yu Yu Hakusho One of a Kind Sweepstakes now for your chance to win autographed merchandise and other great Yu Yu stuff! 177 prizes will be awarded. 24 of them will be autographed by the original FUNimation voice actor! Friday, 7.9.04 Mega-Tournament held in Missouri! Looking for something to do on July 16, 17, and 18? Check out the Mega-Tournament hosted by Pop Culture in the Mid Rivers Mall in Saint Peters, Missouri! This event will contain Mega-Tournaments for Dragon Ball GT and Yu Yu Hakusho as well as numerous side events for players of all ages! Along with the Mega-Tournaments, there will also be Anime rooms hosting movies and videos produced by Funimation! Wednesday, 6.30.04 This is the final preview card for the upcoming Expansion Set, "Exhile", which Score has been kind enough to provide for us. Many thanks to Score. Monday, 6.28.04 We're picking up the week wtih 2 more previews for the upcoming Expansion Set, "Exhile", which Score has been kind enough to provide for us. Thursday, 6.24.04 Here's another set of preview cards from the upcoming Expansion Set, "Exhile", which Score has been kind enough to provide for us. Wednesday, 6.23.04 Here's another set of preview cards from the upcoming Expansion Set, "Exhile", which Score has been kind enough to provide for us. Tuesday, 6.22.04 Here's another set of preview cards from the upcoming Expansion Set, "Exhile", which Score has been kind enough to provide for us. Monday, 6.21.04 Let's get the week started with another set of preview cards from the upcoming Expansion Set, "Exhile", which Score has been kind enough to provide for us. Tuesday, 5.14.04 Yu Yu Hakusho – Chapter Black Saga - Dangerous Game – Now Available! Yusuke Urameshi has his hands full as he tracks down Shinobu Sensui, the evil mastermind behind the opening of the tunnel between Demon World and Living World. Sensui has kidnapped Kuwabara believing that he holds the key to completing the tunnel. But before reaching Kuwabara, Yusuke must first dodge his way past Sniper’s incredible barrage of dangerous projectiles. Only then will Yusuke’s team reach the territory of the Gamemaster, a villain who can manipulate reality into a very dangerous game. 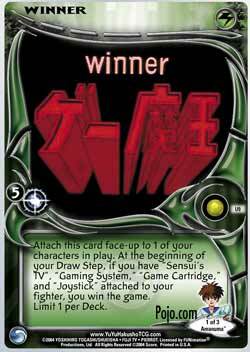 Tuesday, 4.27.04 Today's Card of the Day is Double Barrel Blaster from Expansion: Dark Tournament. Mike B. Fire is in with a review. 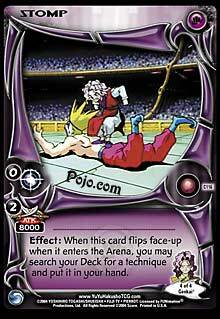 Friday, 4.23.04 Today's Card of the Day is Backstab from Expansion: Dark Tournament. Mike B. Fire has his review today for this card. 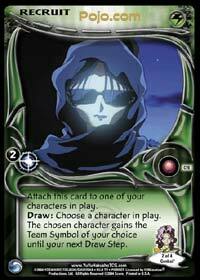 Thursday, 4.22.04 Here are the last 10 cards in our Gateway Preview of Yu Yu Hakusho. Score: We want to extend a Laurel and Hardy Thank You for letting us participate in this expansion set preview! A total of 50 cards have been previewed. The other 40 cards are listed below in previous posts. 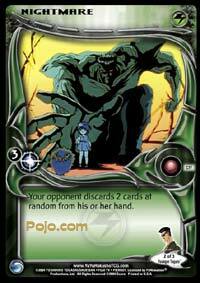 Tuesday, 4.20.04 Today's Card of the Day is Watch from Expansion: Dark Tournament. Mike B. Fire has his review today for this card. 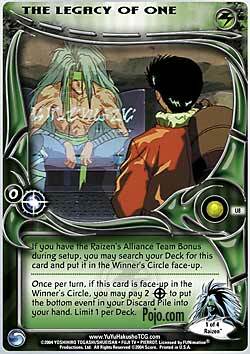 Friday, 4.16.04 Today's Card of the Day is Botan’s Calling from Expansion: Dark Tournament. Israel Quiroz and Mike B. Fire both have a review today for this powerhouse. 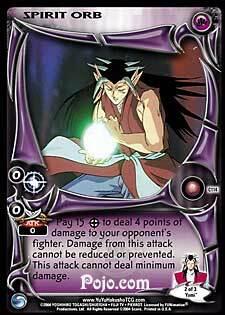 Thursday, 4.15.04 Today's Card of the Day is Calling the Spirits from Expansion: Dark Tournament. Mike B. Fire, and IQ have reviews today. Tuesday, 4.13.04 Today's Card of the Day is I’m Calling You Out! from Expansion: Dark Tournament. Mike B. Fire and IQ both have a review today for this powerhouse. Friday, 4.09.04 The cool folks at Score are letting us exclusively preview 50 Yu Yu Hakusho cards from the upcoming Gateway expansion on our site over the next 2 weeks! We've already shown you 26 (below), here 13 more! 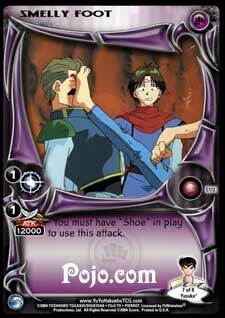 Today's Card of the Day is Armor of Clay from Expansion: Yu Yu Hakusho. Mike B. Fire has a review today. 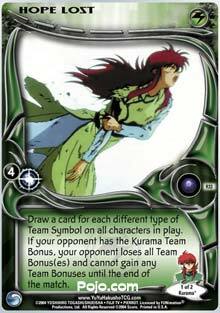 Thursday, 4.08.04 Today's Card of the Day is Rose Whip Thorn Wheel from Expansion: Yu Yu Hakusho. Mike B. Fire has a review today. Tuesday, 4.06.04 The cool folks at Score are letting us exclusively preview 50 Yu Yu Hakusho cards from the upcoming Gateway expansion on our site over the next 2 weeks! We've already shown you 15 (below), here 11 more! All the cards shown so far have been commons. Next time we'll start showing your some Rares and Ubers! 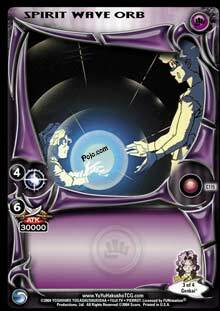 Today's Card of the Day is Orb of Baast from Expansion: Yu Yu Hakusho. Mike B. Fire and Blue Boy have reviews today. Monday, 4.05.04 The cool folks at Score are letting us exclusively preview 50 Yu Yu Hakusho cards from the upcoming Gateway expansion on our site over the next 2 weeks! Last Tuesday we showed you 5, here 10 more! Friday, 4.02.04 Friday's Card of the Day appropriately enough is Party Time from Expansion: Yu Yu Hakusho. Mike B. Fire takes a look at this weekend card. Thursday, 4.01.04 Today's Card of the Day is Ooops! from Expansion: Dark Tournament. Mike B. Fire and Sayjin both have a review today. Tuesday, 3.30.04 The cool folks at Score are letting us exclusively preview 50 Yu Yu Hakusho cards from the upcoming Gateway expansion on our site over the next 2 weeks! So let's not delay! Here are today's 5 new cards! 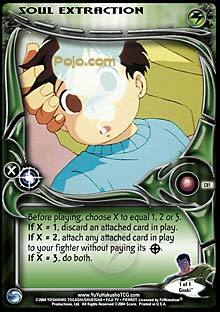 Today's Card of the Day is Demonic Tricks from Expansion: Yu Yu Hakusho. Mike B. Fire has his review today. 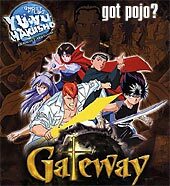 Friday, 3.26.04 Inquest fans vote Yu Yu Hakusho TCG the "game of the year". Full Details right here. 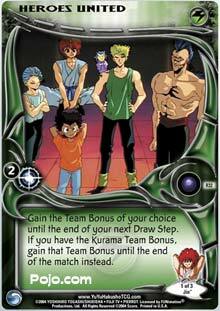 Today's Card of the Day is Chu, Team Captain from Expansion: Yu Yu Hakusho. Mike B. Fire and Wolfwood TheCross have reviews today. 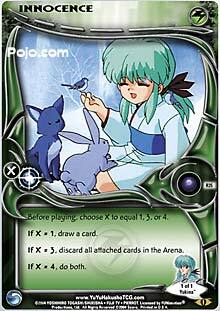 Thursday, 3.25.04 Today's Card of the Day is Rinku from Expansion: Yu Yu Hakusho. Mike B. Fire has a review today. Monday, 3.23.04 Today's Card of the Day is Zeru, the Phoenix from Dark Tournament. Sayjin and Mike B. Fire have reviews today. 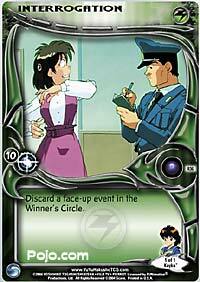 Friday, 3.19.04 Today's Card of the Day is School Girl Outfit from Expansion: Yu Yu Hakusho. BlueBoy has a review today. Thursday, 3.18.04 Today's Card of the Day is Spirit Beast Egg. BlueBoy has a review today. Wedneday, 3.17.04 I had a hard drive crash, and it took a long time to get things back in order. So my apologies. Things are back up and running, and we will have 3 new Cards of the Day for you this week. Today we are looking at Stand Off from Dark Tournament. We have three reviews for you today. Monday, 3.01.04 Today's Card of the Day is Puu, Teddy Bear with a Beak. Mike B. Fire is kinda iffy on this card. Check it out, he'll explain why! Friday, 2.27.04 Today's Card of the Day is Display of Power. Five people check in with reviews for you this fine Friday afternoon! Monday, 2.23.04 Today's Card of the Day is Hiei's Essence. IQ, Mike, Sayjin & BlueBoy have reviews for you today. Friday, 2.20.04 Today's Card of the Day is Ancient Tactics. WolfwoodTheCross, IQ, Sayjin & BlueBoy have reviews for you today. Wednesday, 2.11.04 IQ stopped by and added a review to Flee the Arena today in the Card of the Day section. Monday, 2.09.04 Today's Card of the Day is Flee the Arena. WolfwoodTheCross has reviews for you today. Thursday, 2.05.04 WolfwoodTheCross & BlueBoy are back again today with a new Card of the Day. Today we are looking at Rando Appears in the Dark from the Dark Tourney expansion. Tuesday, 2.03.04 WolfwoodTheCross & BlueBoy are back again today with a new Card of the Day. Today we are looking at Theft in the Dark from the Dark Tourney expansion. Thursday, 1.29.04 Today's Card of the Day is Suzaku the Fierce. Sayjin and IQ have reviews today. Monday, 1.26.04 IQ & BlueBoy are back again with a new Card of the Day. Today we are looking at Murubu the Pestering from the new Dark Tourney expansion. Thursday, 1.22.04 IQ, WolfwoodTheCross, BlueBoy & Sayjin are back again with a new Card of the Day. Today we are looking at Genbu, Master of Stone from the Dark Tourney expansion. Friday, 1.16.04 IQ, WolfwoodTheCross & Sayjin are back again with a new Card of the Day , and all 3 consider this about the most powerful card in the new expansion. Check out the reviews today. Wednesday, 1.14.04 We have something cool for you going on with the Card of the Day ... IQ (one of the game's designers) has decided to join the COTD staff. 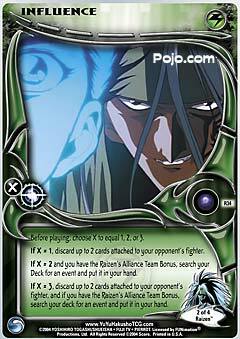 IQ, WolfwoodTheCross & Sayjin have reviews for you today of a new Dark Tournament card. Tuesday, 1.13.04 Do you guys want to see a really rare card? Check out this puppy that's for sale on Ebay. As of today it's sitting at $540. Saturday, 1.10.04 Funimation has revamped their Official Yu Yu Hakusho page, and with it new episode titles for the Sensui/Makai Door/Chapter Black saga. Pick any name you like for it, but FUNi is going with Chapter Black. Anyway, the episode summaries page has been updated with the new titles. Later! 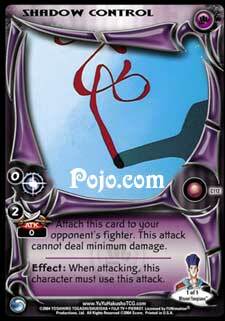 Tuesday, 1.6.04 Today's Card of the Day is Kuro Monotaru. WolfwoodTheCross & Sayjin have reviews for you today. Thursday, 1.1.04 Today's Card of the Day is Kuwabara, Street Fighter. BlueBoy, WolfwoodTheCross & Sayjin have reviews for you today.